Draw Mode creates stepped automation envelopes that snap to the current grid setting. Breakpoint Mode creates smooth lines and curves, but does not follow the grid. 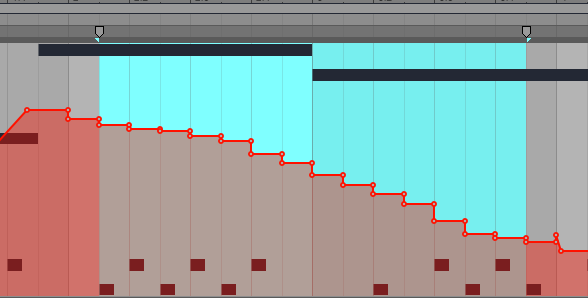 A long-standing feature request of Ableton Live users is the ability to snap breakpoints to the grid in Breakpoint Mode. While I agree that having some kind of key modifier to enable snapping while you're using Breakpoint Mode would be ideal, there are two pretty easy methods to snap/quantize breakpoints in Live's automation envelopes that you can use right now. 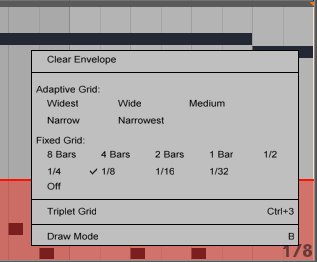 The screenshots in this post show me editing automation in a Session view clip (which is only possible in Live 9), but these same steps also apply to automation in Arrangement view, in both Live 8 and all versions of Live 9: Ableton Live 9 Intro , Ableton Live 9 Standard , and Ableton Live 9 Suite . This is probably the most common method people use, although it usually requires more clicks. If you are using Breakpoint Mode but you need a specific part of your envelope to snap to the grid, press B to toggle into Draw Mode. In this picture I've already switched into Draw Mode and drawn a downward slope with the pencil tool. You can optionally select an appropriate grid setting to determine how many segments draw mode creates while you edit. For example, if you know you need to snap over the length of a quarter note, selecting 1/4 will minimize the number of breakpoints you have to remove later. Once you have the general shape drawn, press B again to toggle back into Breakpoint Mode, then delete any extra breakpoints by drag-selecting them and pressing DELETE, or by clicking them one-by-one to remove them from the envelope. We've selected a region to clean up. After individually disabling the extra breakpoints. This lets you benefit from Draw Mode's automatic snapping behavior while preserving the smooth lines and curves that only Breakpoint Mode provides. This method uses a feature of Breakpoint Mode that is so subtle I think a lot of Live users don't notice it. Form the general shape of your automation envelope in Breakpoint mode and then drag-select in the envelope's timeline to select the region where you would like to snap automation points. The selection should snap to the currently-selected grid setting. With the region selected, move your mouse pointer so that it is close to, but NOT on top of the line automation line in the selected region. The line segment should change color when your mouse is close enough. Making sure not to actually click the line itself, drag the highlighted segment up or down to where you'd like this portion of the curve to be. When you release the mouse button, breakpoints will be created at the start and end of the selected region on the timeline.